Discussion in 'Football Recruiting' started by Smith, Mar 2, 2010. 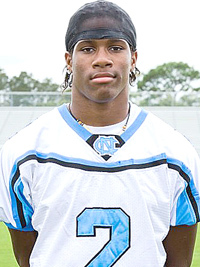 Florida State is one of the most recent offers for wide receiver Ja'Juan Story (Brooksville, Fla./Nature Coast). The 6-foot-3, 190-pounder also has offers from North Carolina, South Florida, Marshall, Florida International, Pittsburgh and others. Ohio State also has issued a verbal offer. The truth of the matter is that Story has no current leader and that?s probably best. Offers are going to continue to pour in for him so there will be much to consider in the ensuing weeks and months. No doubt there will be plenty of developments in Story?s recruiting this Spring. Stay tuned. By the Bank... called OSU asking about an offer and learned they offered awhile ago (lost in mail). Will visit OSU this summer and is looking for strong academics. Excellent, a great offer. Gotta love his size out there as he would be an excellent complement to Spencer and Wynn. I like that he called us for the offer to learn about it getting lost... shows that he is highly interested I would imagine. I give up; I've always been terrible at fill-in-the-blank puzzles. Not that reading BP updates suggests anything else to me, but what is the basis for your opinion? Premium content you can't quote? BP news? Other? out-swaggerizes would work if the blanks were reversed. One of the nation's biggest college football rivalries has a new front in Brooksville. Nature Coast WR Ja'Juan Story is in a tug-of-war between Ohio State and Michigan. The Buckeyes offered him a scholarship Tuesday and the Wolverines followed with an offer Thursday, Nature Coast assistant Robert Kazmier said. Story also received an offer from Georgia Tech last week. "He's hot commodity," Kazmier said. Several schools have told Kazmier they want to evaluate Story this spring. Story has spoken with several head coaches including Pittsburgh's Dave Wannstedt, North Carolina's Butch Davis and Florida's Urban Meyer. Story plans to take an unofficial visit to Florida in the coming weeks, Kazmier said. Story has offers from schools including Florida State, USF, Florida International, Pittsburgh, North Carolina, Kentucky, Marshall and Iowa State The 6-foot-4, 185 pound rising senior primarly played receiver and defensive back in 2009, also sharing time at quarterback. At receiver, he had 13 receptions for 423 yards (32.5 yards per catch) and three touchdowns. At quarterback, he had 27 carries for 265 yards and two touchdowns (just two starts as a quarterback). Defensively he had 22 tackles and one sack. By Newberg...has offers from Florida State, USF, Ohio State, Pitt, Marshall, Rutgers, Maryland, Iowa State, Kentucky, Michigan, Minnesota and North Carolina...visiting Florida next weekend. He is a really big FSU fan from a big FSU family. The good news is, FSU has taken large wide receiver classes the last two seasons. They are only looking to take 1 or 2 guys this year, and Story may not be the highest on their board.